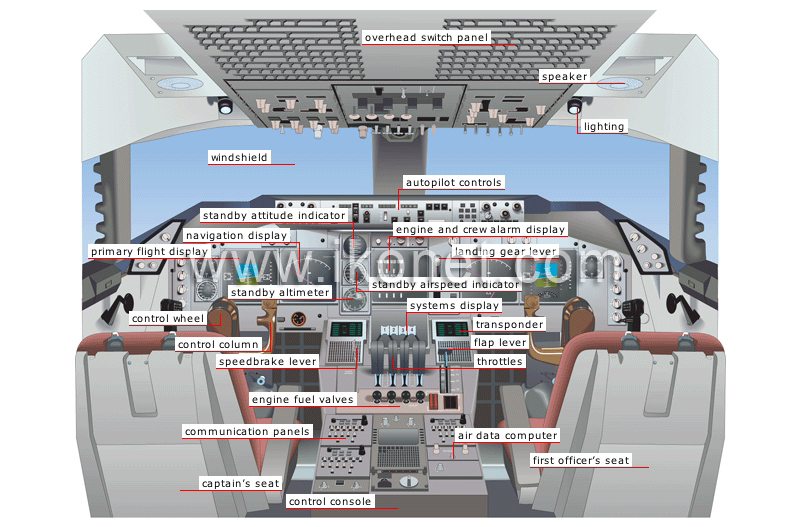 Compartment that contains navigation equipment and controls and from which the crew pilots the aircraft. Computer that calculates the flight parameters (speed, altitude and course). Instruments that, with the autopilot, control the engine power and guide the aircraft on its course. Right seat occupied by the copilot, who is second in command. Control stick that activates the wing slats and the trailing edge flaps. Component located between the two seats that contains part of the instrumentation. Knobs for opening and shutting the fuel supply to the engines. Panel for selecting radio frequencies on which pilots can send or receive. Control levers for the engines; they regulate speed and thrust. Left seat occupied by the pilot, who is in charge of the flight and the crew. Screen that controls various systems, such as air pressure and the electric and hydraulic circuits. Command stick that releases the wing flaps to brake the aircraft immediately after landing. Lever that activates the control column from back to front and from side to side. Steering component that causes an aircraft to bank to the left or to the right and to ascend or descend. Screen that shows the main parameters necessary for piloting (aircraft’s position in relation to the horizon, altitude and course). Screen that shows the aircraft’s position and flight plan and weather conditions. Instrument that shows the vertical distance between the aircraft and the ground; it is used in the event the flight display fails. Instrument that shows the aircraft’s speed; it is used in the event the flight display fails. Screen that shows the aircraft’s position in relation to the horizon; it is used in the event the flight display fails. Highly durable pane made of glass and plastic that provides good visibility. Screen that controls the engines and displays alarm signals in the event of system failure. Device that enables the aircraft to be piloted and kept on course automatically. Control for lowering and raising the landing gear. Panel made up of the switches that cut the hydraulic, electric and fuel circuits. Device that diffuses light over a shelf on which the pilots place navigation charts. Integrated device that relays audible messages such as alarms to the pilots.